Peterhead to St Combs. 14 Miles. After walking through Peterhead, follow the road to Peterhead golf couse which lies to at the outskirts of town near Buchhaven. Cross the river over the footbridge and head north along the beach. Continue on the beach past the gas refinery and the lighthouse at Rattray. At the end of the Back Bar sand dunes, you will have to go inland to cross the water, where a small footbridge is provided across the stream. Head for the path along the back of the dunes until St Combs is reached. BLOG: This was a lovely beach walk with a very strong wind blowing from the south which helped things immensely. Had the wind bown from the north it would have been almost impossible to make any progress. The first thing of note was tbe large gas terminal at St Fergus, with its gas flairs and miles and miles of piping. A couple of miles further on was the lighthouse ar Rattray head which lay only just offshore. I saw a fox scampering over the dunes at this point and lots of artic terns wheeling around the shoreline. The sands looked beautiful but obviously the sea was treacherous. 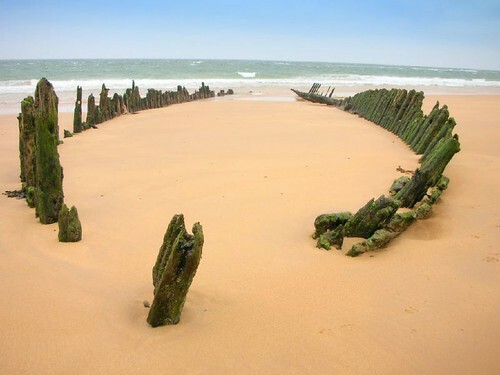 I saw evidence of 2 boats that had run aground on the sandbars and the remains of their wooden hulls was all that could be seen jutting above the sand like black rotting rib cages of some long deceased animal. This entry was posted on Monday, April 24th, 2006 at 11:25 pm and is filed under Scotland, trail, Travel, trek, walk. You can follow any responses to this entry through the RSS 2.0 feed. You can leave a response, or trackback from your own site.